Before I start I ought to give a full disclaimer: I am currently rehearsing for Bromley Players production of Side Show and I adore it. I appreciate it isn’t everyone’s cup of tea as it didn’t run for long on Broadway and has never made it to the West End (just a fringe production at Southwark Playhouse) however I think the story and music is beautiful. The show, based on a true story, tells of conjoined twins, Daisy and Violet Hilton who, at the start of the show are in a Side Show under the guardianship of ‘Sir.’ They soon get spotted by Terry Connor and Buddy Foster who help the twins rise to fame on the Vaudeville circuit. However the twins soon fall for Terry and Buddy but being conjoined things such as love is never straightforward. The first thing that struck me about this show, from the moment I entered the auditorium, was how atmospheric it was. The cast were sat behind a giant screen depicting the twins feature film ‘Freaks’ whilst Side Show posters were strewn across the walls. There was red and white circus swaging surrounding the audience on the ceilings and dropping to the ground as the backdrop for the show. This atmosphere was built on well by effective, moody lighting throughout the piece. The production values of this company are clearly high and a lot of consideration had gone into the mood and feel of the piece to great effect. The show focuses on Daisy and Violet Hilton, played by Katie Beudert and Lauren Edwards retrospectively. The show is very demanding on them as they very rarely leave the stage but both performers seemed to take this in their stride. The twins have very distinct characters, with Daisy, the assured twin seeking fame and Violet, the one who longs for nothing more than to settle down at home. This was drawn out wonderfully by Beudert and Edwards. My only criticism of the girls would be that sometimes the vocals became slightly shouty and at these points they stopped blending well. This meant that in the heart wrenching, Act 1 finale, ‘Who Will Love Me As I Am,’ some of the tenderness was lost. Buddy, Daisy’s love interest was played by Barry O’Reilly. Buddy is the ‘song and dance’ man who helps teach the girls. He was very convincing in this role especially due to his dance ability in the Vaudeville numbers. Matthew James Nicholas played Terry Connor, the man that sets the girls rise to stardom in motion. He had a great baritone voice with a rich tone to it. His portrayal of the character was also spot on, leaving the audience unsure throughout if they should buy into him. Each of the ensemble had very clear characters and committed to their Side Show character very well. A special mention must go to Hannah Parker Smith who played Venus De Milo, her commitment to all of the movement, without arms was admirable! The movement of the whole cast was in keeping with the moody show design with many moments highly stylised, which worked very well. Some of the dance numbers could have been sharper and to the same precision of the stylised movement. The 11 piece band, under the control of John Reddel did justice to the score, playing it beautifully. The band was also balanced well by Adrian Jeakins. At times I would have liked the harmonies to be slightly stronger from the ensemble and there were a few shaky entrances although understandable given the complexity of the music. Pint of Wine Theatre Company have taken a remarkable amount of care with this show and it deserves to be seen by many. A stunning, atmospheric show that serves to remind us that there is a ‘freak’ in all of us. 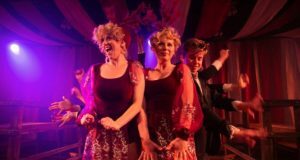 Side Show is playing until the 13th October at CLF Arts Café, Bussey Building, Peckham.To find out more about Pint of Wine, visit their website. If you like my review of Side Show you might also like my original review of the Southwark Playhouse production as well as reviews of Pippin by Sedos and Circa’s Peepshow.